Thank you to all who joined our Communities webinar on Halloween! If you missed the webinar, we have posted the recording here. We got some *spooktacular* questions in the chat after the demo and we wanted to recap for everyone who made it, or for anyone just now catching up on our blog. Communities are evolving with every release and it’s hard to keep up so hopefully these answers will lead you to a solution for a problem you wanted to solve. Can I prioritize the display of certain knowledge articles to certain categories of people? Audiences: Segmentation Criteria for the Audience has gotten a complete makeover in the Winter 19 Release and is more powerful than ever! Can components’ visibility be controlled by Profile or should you make different pages? Another problem admins can solve using Audiences! These features are more powerful than ever. Use lookups within Formula logic to pinpoint your specific criteria and minimize the administrative oversight of managing multiple page variations when Component Visibility can now be applied in the Community Builder per Component on a Page. This is similar to a LEX filter component you may be using in your internal LEX app. Add a formula field (checkbox) to the Contact record, and calculate whether the Contact is associated to a “Top Account” (true or false) by validating if the Account has annual Won Opportunities Greater than $250K. Use the Audience to target your content! 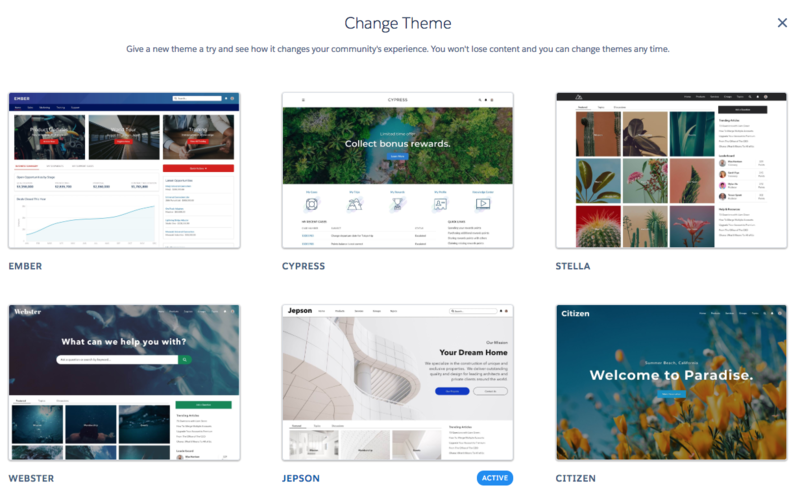 I love the look of new styling Themes, can I test this out in my Community without messing anything up? Yes! Go the Community Builder > Branding and find a Template. You can preview the Template and then go back and select your original if you decide you don’t want to proceed on the changes. We LOVE Hero components. They are one of the great calls to actions you can now take advantage of on your Home Pages within the new Themes. Give it a try and choose for yourself what best suits your users, a call to action button or two or a prominent search component driving users to find all your awesome content. If you have additional community questions, or if you would like help getting started with your own community, comment on this blog post or tweet us with the hashtag @GearsCRM #GearsCommExpert for a response from our Communities team!